Current Status: Active; formed by the merger of Dorchester and West Roxbury Lodges, 06/01/1990. Officers at the time of the merger. Front row, left to right: Bro. Vahan Vartarian, Treasurer; Bro. Mark V. Coleman, Senior Warden and Master-Elect; Wor. Melvin N. Orenstein, presiding Master; Bro. Robert P. Shedd, Junior Warden; and Bro. Edward David, Secretary. Rear row, left to right: Bro. Otto W. Engdall, Tyler; Bro. George W. Rollins, Organist; Wor. A. Richard Merrill, Marshal; Bro. James L. Dollivar; Bro. Michael S. Daoud; Wor. Robert B. Shedd; and Bro. Lawrence H. Rosen, Chaplain. From Bro. Lawrence R. Rosen, TROWEL Rep. and Chaplain of the newly merged Lodge, comes a fine write-up and photo of the Brethren who will guide the Lodge as they enter a new phase. 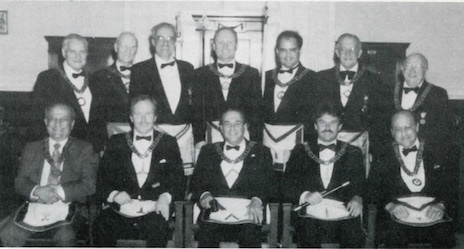 On Sept. 15, 1990, these newly-merged Lodges held their first installation and seated Wor. Mark Vernon Coleman as Master. 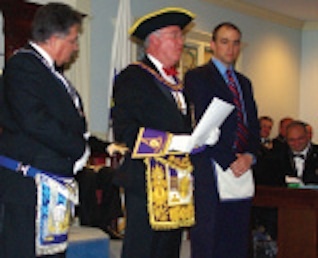 The photo shows the Brothers who will assist the Master in the Lodge functions. Bro. Rosen points out that West Roxbury Lodge was constituted in 1920. in quarters in the Town of Roslindale, MA, and for most of its life occupied quarters in the Roslindale Masonic Temple. Due to the layout of the building, it was soon apparent that they could do better by moving to the Town of Dedham, MA, where easier access and fewer stairs for climbing would encourage better attendance. Dorchester Lodge was constituted in the Masonic apartments in the Upham's Building at Upham's Corner, Dorchester, MA, in 1912. A change in the neighborhood prompted them to move to apartments in the Grand Lodge building in Boston. Changes in the new neighborhood caused the attendance to suffer, and new surroundings were deemed necessary, as well as an infusion of new blood. This led to talks with West Roxbury Lodge with a merger plan in mind. The decision was finally made for a merger, which was accomplished on June 1. 1990 under the supervision and the authority of M. W. Edgar W. Darling. Grand Master. West Roxbury-Dorchester Lodge celebrated its 100th anniversary with many distinguished guests on April 1, 2013. 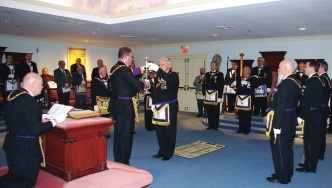 The side lines, full of brothers, viewed an ancient carpet ceremony rededicating the lodge that was performed by Grand Lodge members including Grand Master Richard James Stewart. Grand Lodge officers perform the ancient Carpet Ceremony during the rededication. Four brothers received awards from the Grand Master. Brothers Erick Kainen and Jim Russo were awarded the Master Mason Rookie Award. Brother David Josie became the newest Masonic ambassador and received his diploma. Master of the lodge. Wor. Robert P. Shedd received the fourth Master Builder’s Award for the lodge. Grand Master Richard Stewart presents the Master Mason Rookie Award to Bro. Erick Kainen (right); Wor Master Robert Shedd is at left. The Grand Master was amazed at the number of Rookie and Master Builder Award recipients, and complimented the lodge on how healthy it has become. The event was a night to remember for members of West Roxbury-Dorchester Lodge, which has adopted a new motto — Family, Fun & Fellowship — and looks forward to the next 100 years! This page was last modified on 27 December 2018, at 07:56.